Broni has some really cool summertime colors based on these fun watermelon popsicles for this week's Color Throwdown Challenge! 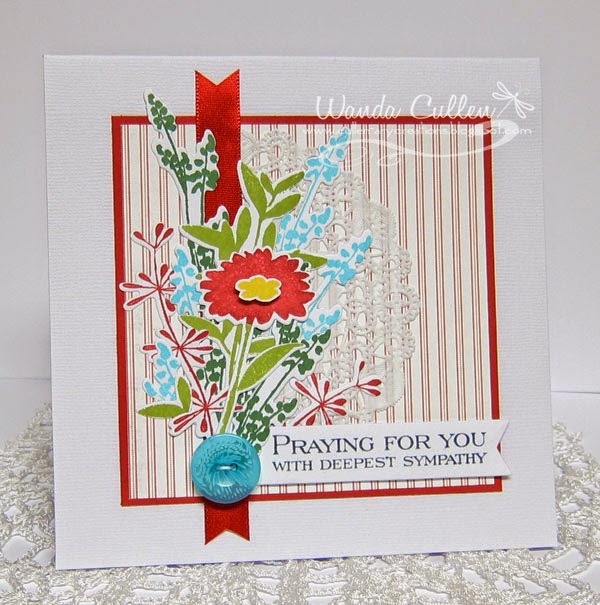 Sadly, I was in need of a sympathy card, so went with a bouquet of flowers for my design using a couple of PTI stamp sets. After die cutting a number of coordinating dies for the Larger Than Life set, I stamped in Garden Green, Lucky Limeade, Real Red and Cool Caribbean inks. The flower center is Daffodil Delight. 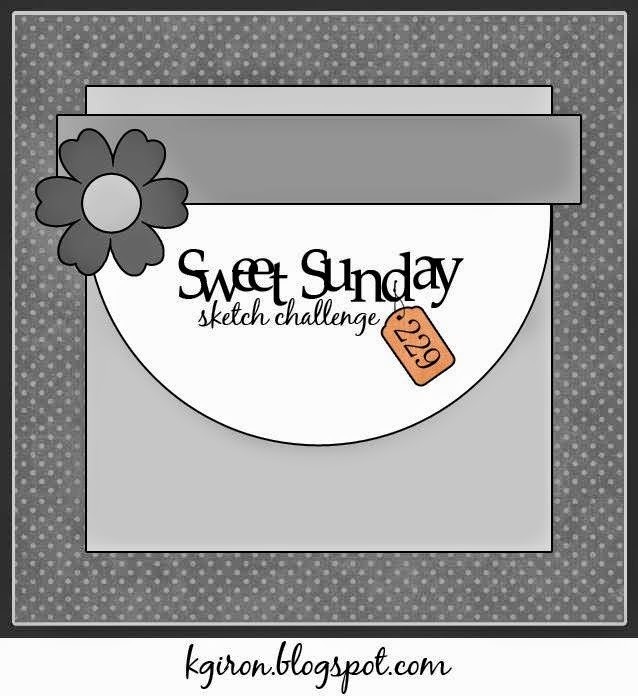 I'm using Karen Giron's layout for this week's Sweet Sunday Sketch Challenge - flipping it to the side. 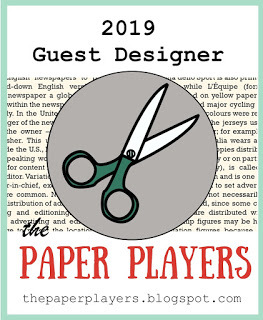 We have to say thank you and goodbye to our July guest designer - Diane Jaquay - who gave us some fabulous samples each week! 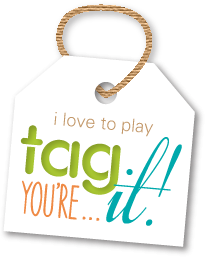 Stay tuned to meet our super talented August guestie next week! STAMPS: Larger Than Life (PTI), Boutique Borders: Sympathy (PTI). PAPER: Pure Poppy (PTI), Premade textured CS card base (Michael's), Quilting Bee 6x6 pad by MME, White. INK: Garden Green, Lucky Limeade, Real Red, Cool Caribbean - all by SU, Black Licorice (MFT). ACCESSORIES: Paper doily, Pure Poppy satin ribbon by PTI, Button by SU, Larger Than Life dies by PTI, Fishtail Flags Die-Namics by MFT. 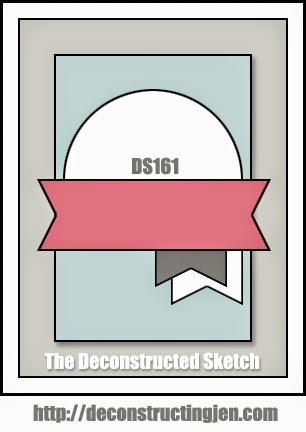 For the current Deconstructed Sketch Challenge. I had the Melon Mambo panel with silver embossing paste using a herringbone stencil in my scrap pile for months. I decided to layer up a paper doily, some white embossed vellum feathers, a horizontal banner flag die and a decorative brad to accent one of my fave sentiments. 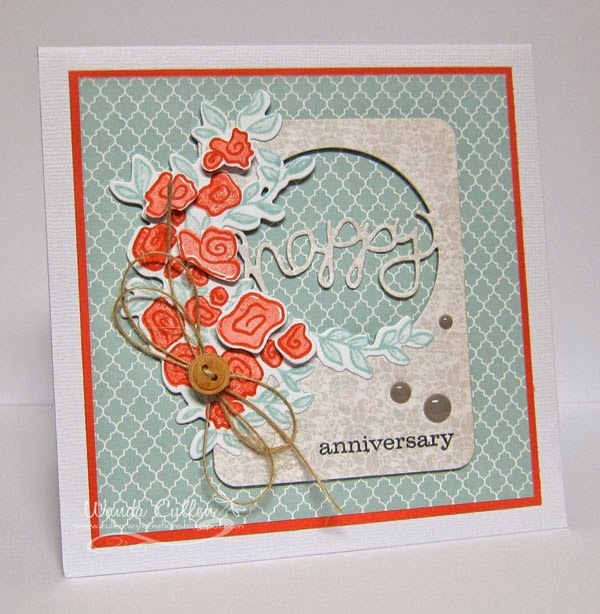 ACCESSORIES: Wilton paper doily, Brad by SU, Banner flag die by Lil Inker Designs, Stitched circle die by Lil Inker Designs, Silver embossing paste by Wendi Vecchi, Fine detail white embossing powder by Stampendous. Good Monday everyone! It's tall and skinny week at the Mojo Monday Challenge blog and I have another 3 1/2" x 5 1/2" card for you. You will need your shades for this one! I pulled this piece of leftover yellow (I think it's SU Summer Sun) from my scrap pile. The patterned papers are from the Family Ties pad by Pebbles and they were also scraps from a previous project. 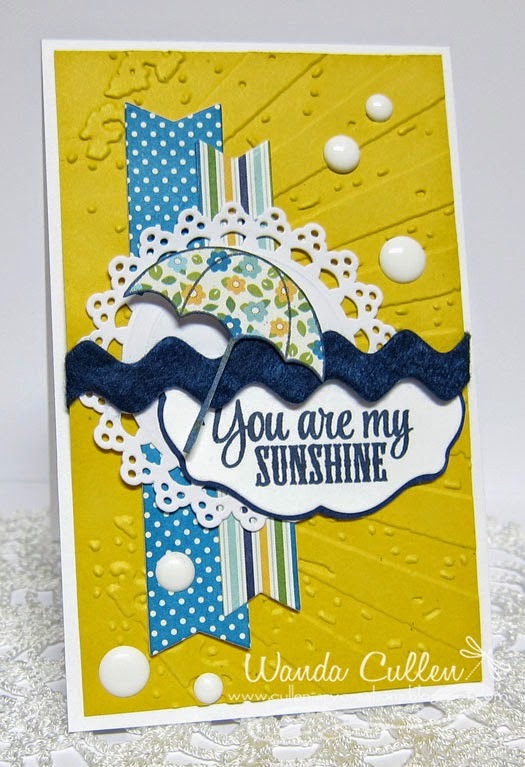 The background was embossed using Tim Holtz' "Rays" embossing folder. I added some felt rickrack and enamel dots to finish up the design. ACCESSORIES: Curvy Bookplate Die by Verve; Doily tag by Martha Stewart, Felt rickrack by My Mind's Eye, Enamel dots; Rays EF by Tim Holtz; Fishtail Flags Die-Namics by MFT. It's been a long time since I played along with the MFT Wednesday Sketch Challenge! I needed a baby card, so this was the perfect opportunity to use some of their sweet little baby dies! Papers are from Nana's Nursery pad by DCWV. The pink CS is from my scrap pile - not sure of color. Dies are all from My Favorite Things. It's going to be a full weekend with stamp club in the morning then fixing food for a family reunion on Sunday! Hope you are having a great w/e! international traveler and I'm guessing this is a scene in Venice that she recently visited. 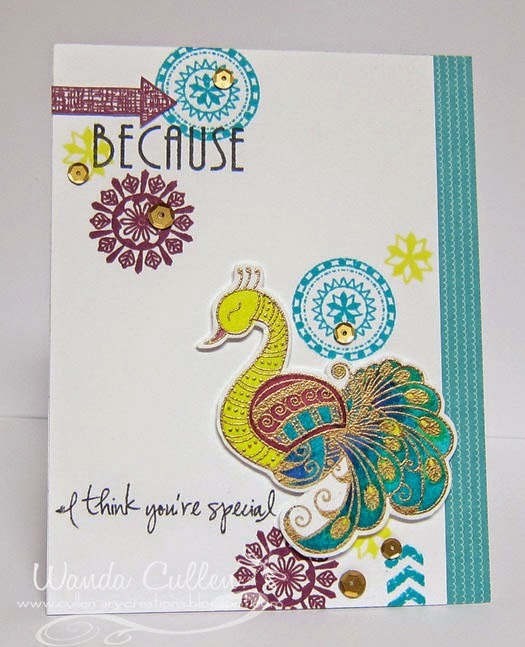 I knew these beautiful colors would be perfect to showcase a new peacock image that was recently released at Verve - along with the circle images from another new set - both designed by Chaitali. 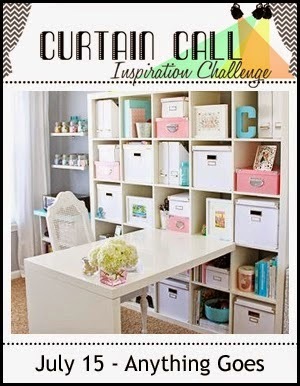 I was also inspired by the 200th CASE Study Challenge card by the talented muse - Shari Carroll! I gold embossed the peacock on Tim Holtz watercolor cardstock then brushed on distress inks - Peacock Feathers, Seedless Preserves and Squeezed Lemonade - then fussy cut and popped with foam dots. The hint of dark blue resulted when the Peacock Feathers and Seedless Preserves inks mixed. I echoed the gold embossing by using gold sequins as embellishments. STAMPS: Peaceful Medallions, Moments Remembered, Take Note - all by Verve. PAPER: TH Watercolor CS, White by PTI, Patterned paper by SU. INK: TH distress inks - Peacock Feathers, Squeezed Lemonade, Seedless Preserves; Black Licorice hybrid ink by MFT. ACCESSORIES: Gold sequins by Avery Elle, Gold embossing powder. 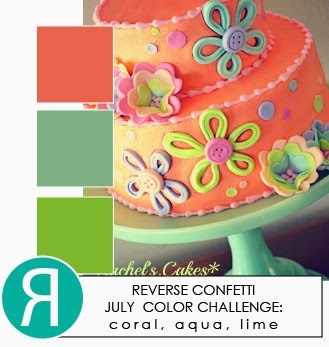 and it meets the Color Challenge on SCS where Mary has given us 7 color choices and we can use all 7 or just 3. Since I didn't have Island Indigo or Lost Lagoon, I went with two shades of blue plus the yellow papers from Authentique's Bundle pad. 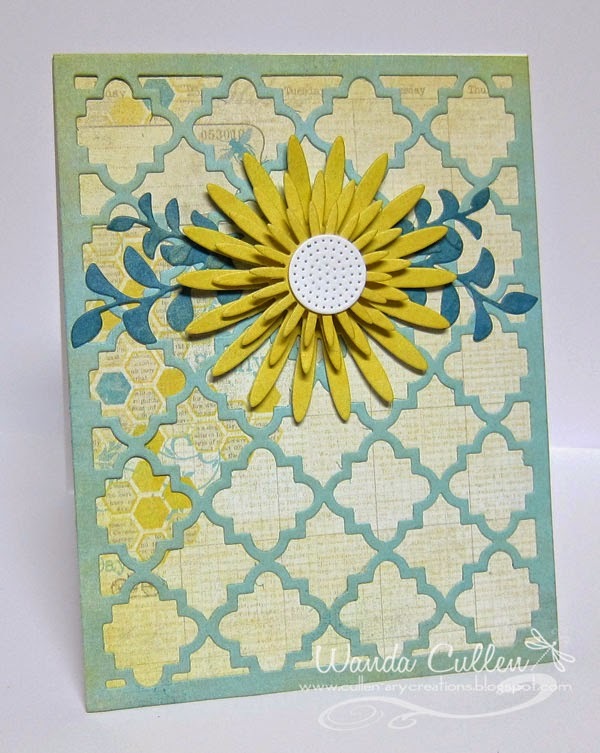 The quatrefoil die over the base patterned paper is from PTI. 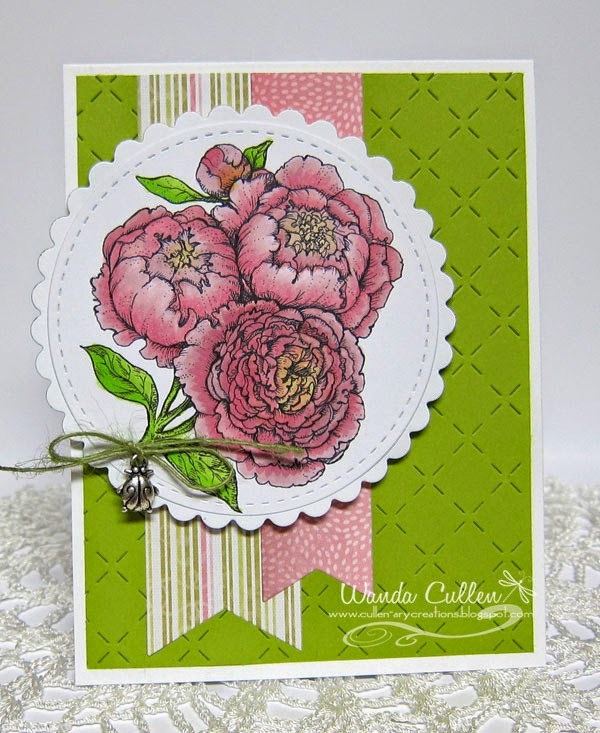 The flower is an MFT Die-Namics die and the leaves were using Verve's Sprightly Sprigs die set. I kept it generic and will add a sentiment to the inside as needed. 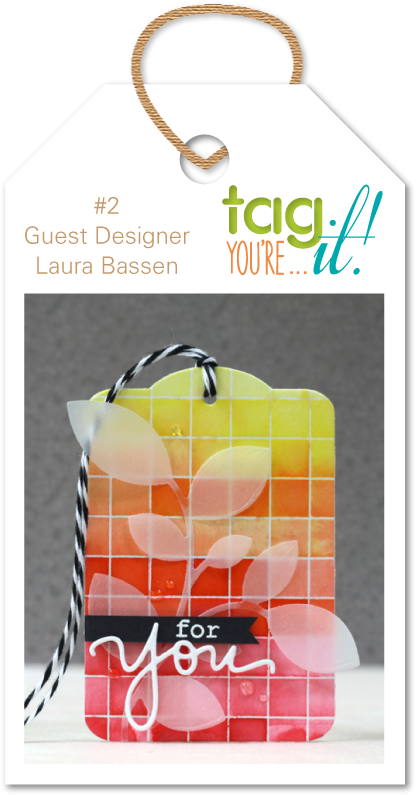 There's a wonderful inspiration tag from Laura Bassen for the Tag, You're It Challenge #2! I was inspired by the gradient colors and used 3 different inks for the sunburst - yellow, orange and pink. I also used 3 different shades of blue for the dots behind the vellum wave die at the bottom...which, unfortunately, is hard to see in the photo. 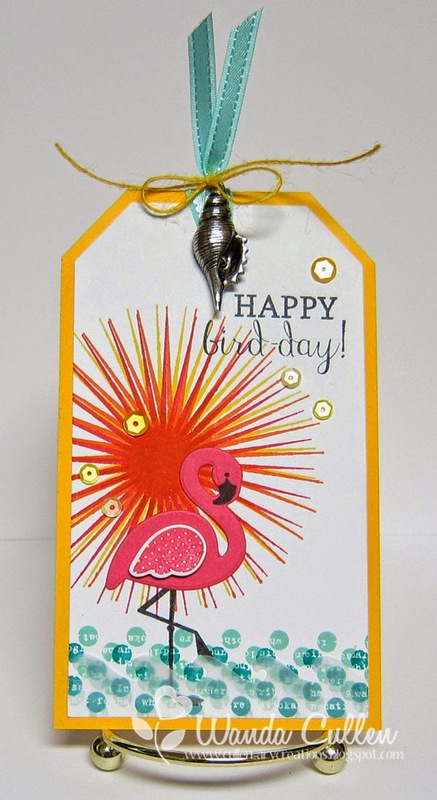 This fun flamingo die with coordinating stamps is from the last new release at Reverse Confetti. STAMPS: Kinda Eclectic (SU), Fabulous Flamingo (Reverse Confetti). INK: Black Licorice by MFT, Daffodil Delight, Tangerine Tango, Melon Mambo, Soft Sky, Pool Party, Bermuda Bay. ACCESSORIES: Silver shell charm, Twine and satin ribbon, Tag Die-Namics by MFT, Fabulous Flamingo dies by Reverse Confetti, Lemonade Blend sequins by Avery Elle. 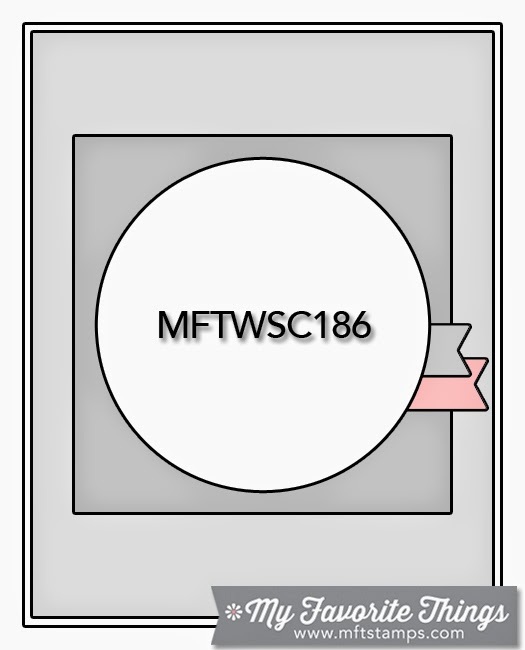 Labels: Reverse Confetti, tag, Tag...You're It! Had to play along with this great layout for the current Retrosketches Challenge. Because these papers remind me of vintage wallpaper, I went with embossing the sentiment in gold and used gold dot embellishments. The large clock brad is one I've had in my stash forever - by Bo Bunny. The medallion die is one of four in a freebie offer awhile ago at MFT when you order at least $60. 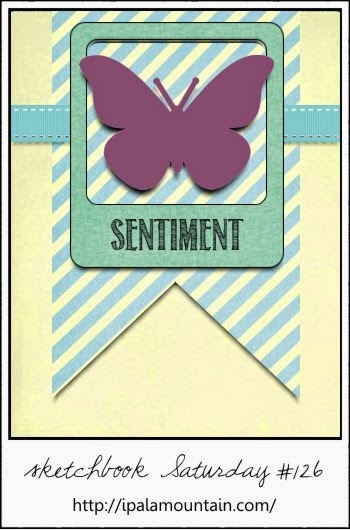 The sentiment is also a freebie from MFT (don't know the name of the stamp set). PAPER: Time Traveler's Memories by Prima Marketing; Vintage Cream by PTI; Julianne by K and Company (green used for leafy flourish). ACCESSORIES: All dies by MFT. Hope you're having a great Monday! I'm off work after working the weekend, so this is a Monday I love! :-) I haven't played along with any of the Power Poppy challenges, but decided it was high time I printed some of the digis I had in my files and get my Copics in gear! So, this is for the Power Poppy Peep of the Week Challenge. I went with adding the sentiment to the inside instead of the card front. 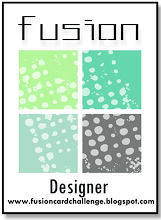 The green base is Simply Chartreuse CS by PTI and was embossed using the quilted pattern die by Lil Inker Designs. 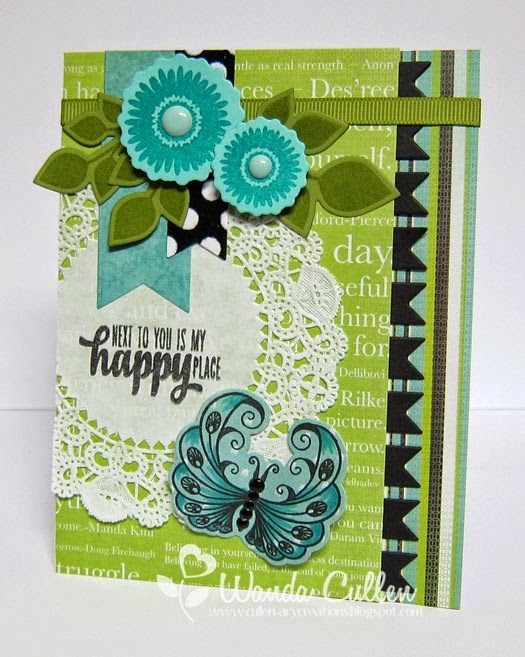 Patterned papers are from The Lake House pad by Kaisercraft - die cut using MFT's Fishtail Flags Die-Namics. A little jute twine and a ladybug charm finished it off! Copics: RV32, RV34, RV93, YG21, YG23, YG25. Thanks so much for stopping by...I always enjoy your comments! Are you ready to get your mojo on? 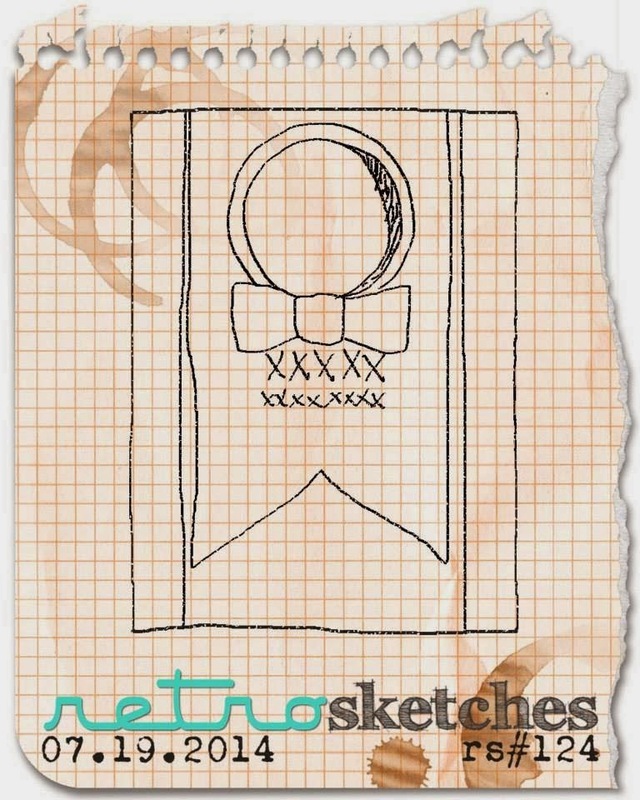 There's another great sketch on board for the Mojo Monday challenge! I've combined some new Verve (butterfly and sentiment) with some old (flowers and leaves). The butterfly was stamped on patterned paper, then Copic marker BG57 was used to shadow in some corners to give more depth. I added black enamel dimensional accents and also some shimmer with a Wink of Stella clear shimmer brush marker. 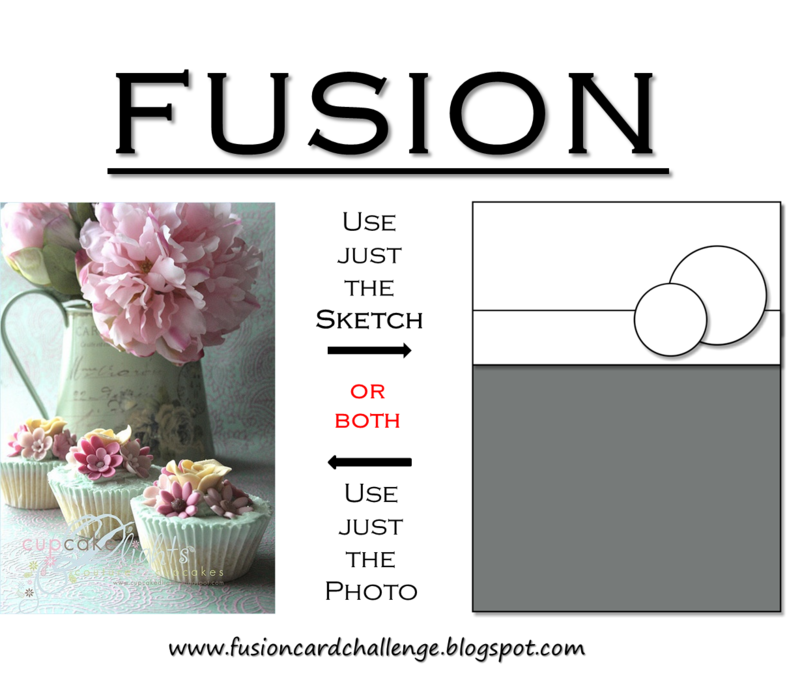 The doily (by Wilton's) is from the cake decorating section at Michael's. STAMPS: Happy Place, Bloom and Grow, Dream Big (all by Verve). PAPER: "Chapter One" by Kaisercraft. INK: Bermuda Bay, Old Olive, Black Licorice hybrid ink by MFT. ACCESSORIES: Happy Doodles, Dreamy Leaves, Floral Circles and Pennant Trim dies by Verve; Doily; Enamel dots by MME; Fishtail Flags Die-Namics by MFT; Grosgrain ribbon by SU. ...that's Wendy's theme for the Free 4 All Challenge over on SCS! I was also inspired by the photo for the current Fusion Card Challenge. 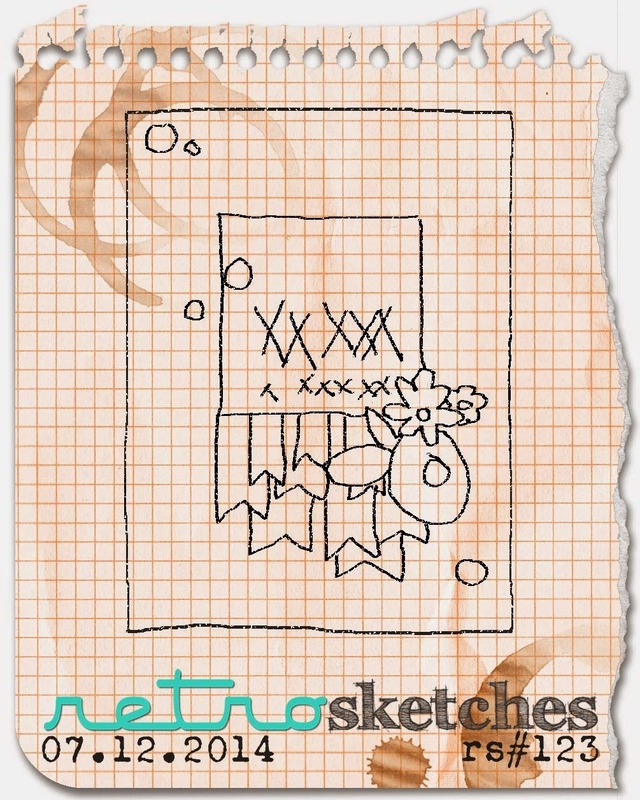 I hope to create another card using the great sketch. freehand washed some light blue to "ground "the vase. I then popped some flower and leaf dies to add dimension. 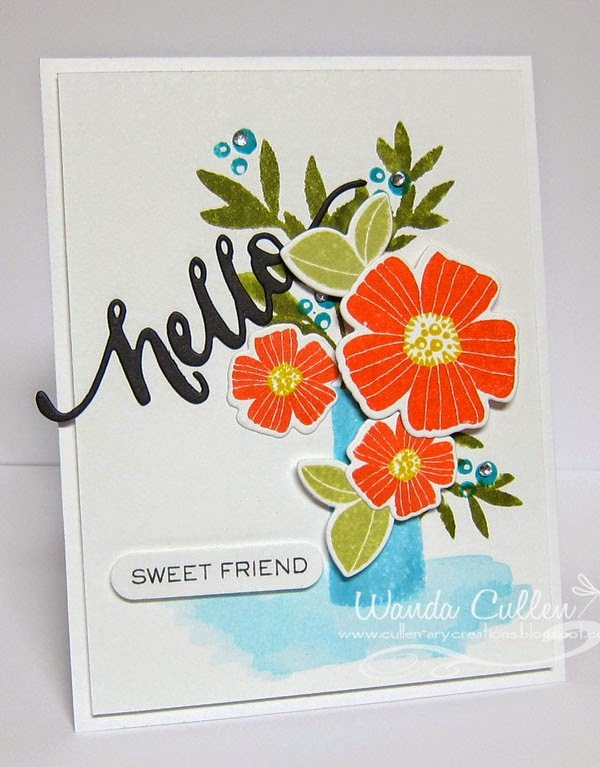 I love this hello die and decided to add sweet friend to the sentiment and send this to a friend who is recovering from surgery. Confession: I stamped it first on the card and it wasn't perfectly straight, so I moved to plan B and used a word window punch to cover up the goof. :-) I'll bet that hasn't happened to any of you - LOL! I just love it when I complete a card and the very last stamping move results in a goof...NOT! 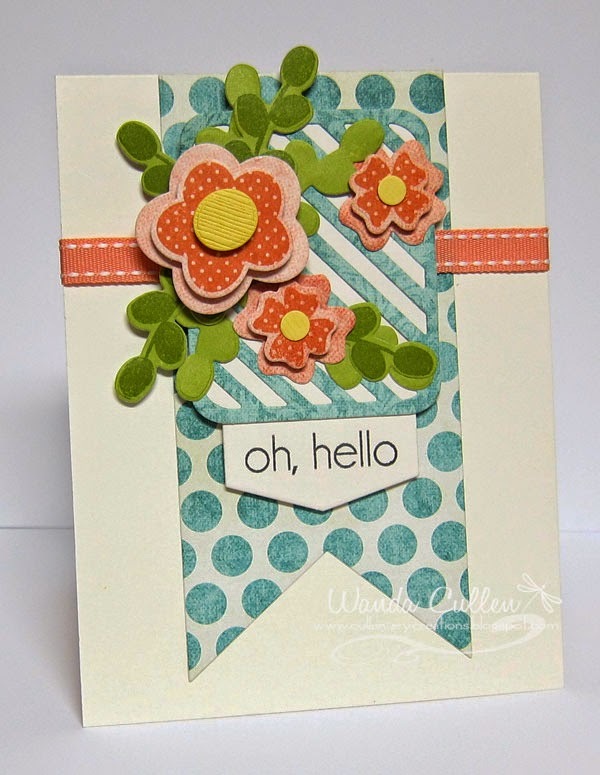 STAMPS: Spring Blooms, Coming Up Roses, Hand Lettered Hello - all by WPlus9. 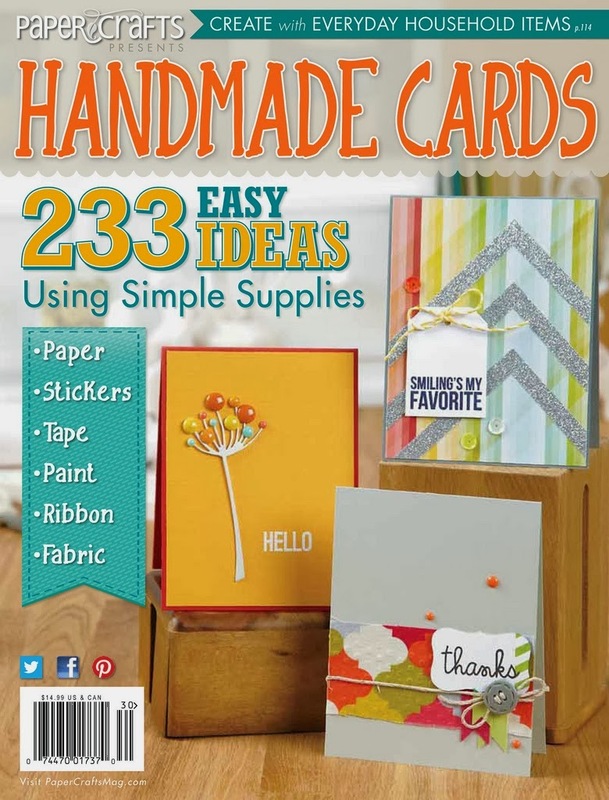 PAPER: Tim Holtz watercolor cardstock, White by PTI. INK: TH distress inks - Ripe Persimmon, Peeled Paint, Shabby Shutters, Peacock Feathers, Tumbled Glass. It's time to take a look back at the July release at ODBD! Hopefully, you didn't miss the fun new pennant stamps and dies that made their debut on July 1st! 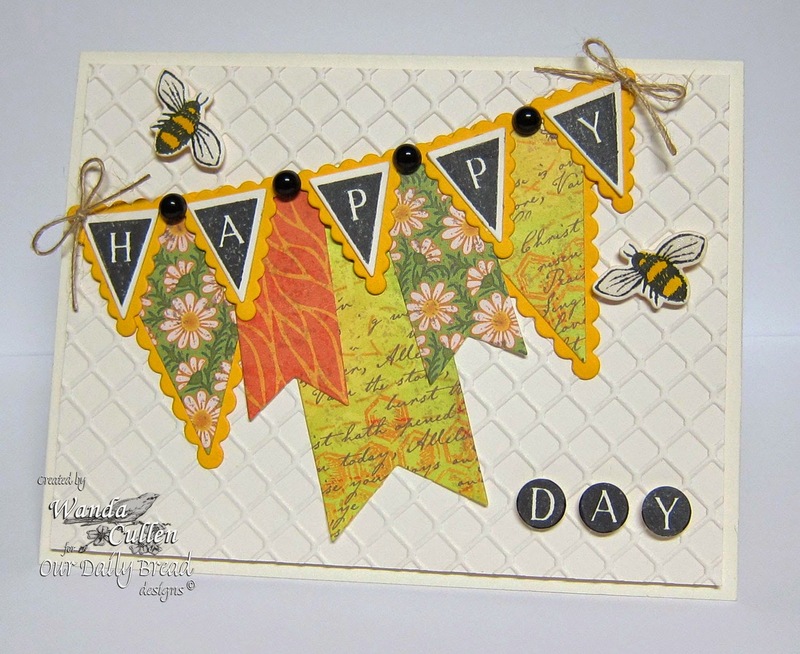 Here's a creation that highlights the versatile Pennant Alphabet Solid stamp set and Pennant Dies. I love the variety of banner die sizes and thought it would be fun to feature a summertime banner using papers from ODBD Blooming Garden Collection. The bees - from the ODBD Zinnia stamp set - were die cut, stamped and colored with Copic marker Y19 and the wings were highlighted with a Wink of Stella clear shimmer brush pen. I discovered I could punch the pennant alphabet with a 3/8" circle punch (SU) which required some minor touch up on the edges using a Copic black marker. The possibilities for sentiments are ENDLESS with this alphabet set! 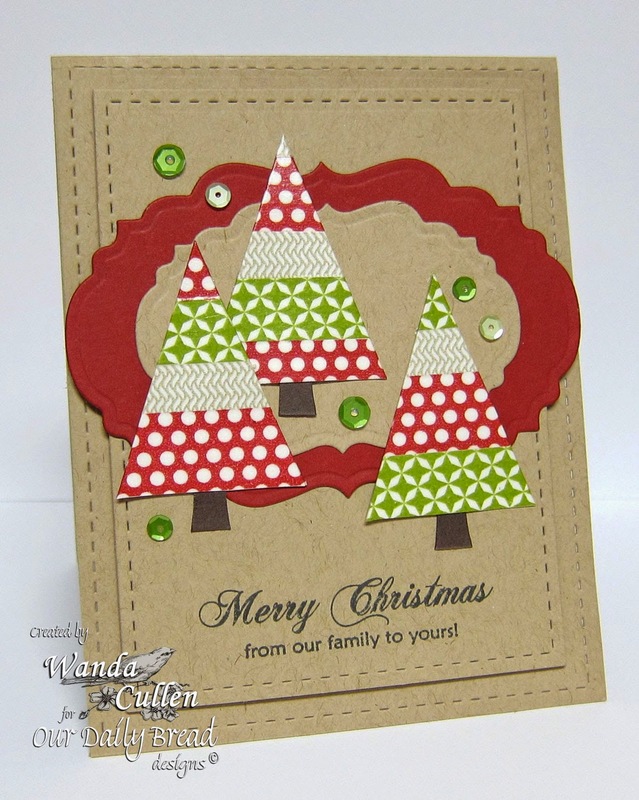 I often try to "think outside the box" with my dies...to see if I can make them more versatile and decided to turn the large pennant die into some Christmas trees. I covered each one with washi tape and freehand cut some "trunks" from brown cardstock. 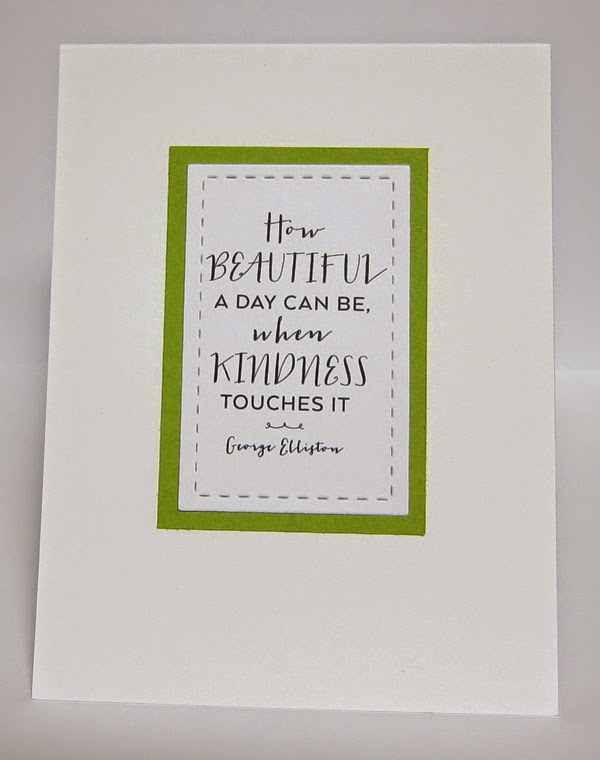 The sentiment is from ODBD Peace and Joy stamp set. The layered dies behind the trees are ODBD Vintage Label dies. 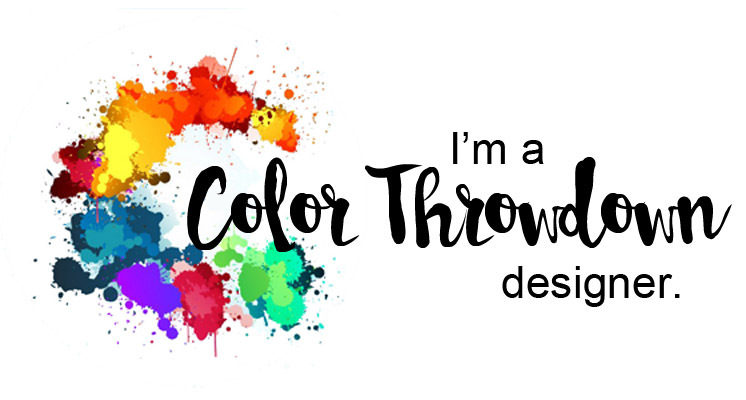 Be sure and check out the rest of the designers' blogs for more pennant inspiration! 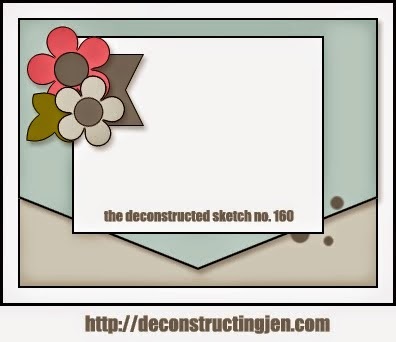 Jen has another fun layout for us in the newest Deconstructed Sketch Challenge! MFT is the sponsor this week, so had to FINALLY ink up this "Beautiful Baby" stamp set that I've had for weeks and never opened. 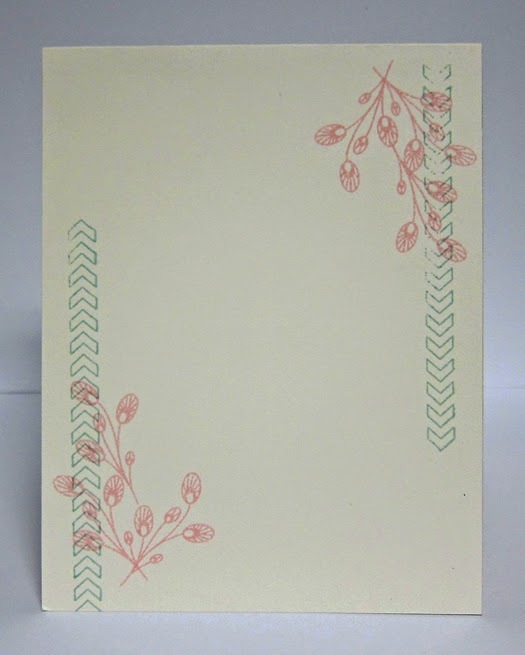 The patterned paper from Echo Park's Bundle of Joy pad was perfect to pair up with this set. I stamped the elephant twice (using Baja Breeze ink) so I could fussy cut his ear and pop it with a foam dot. 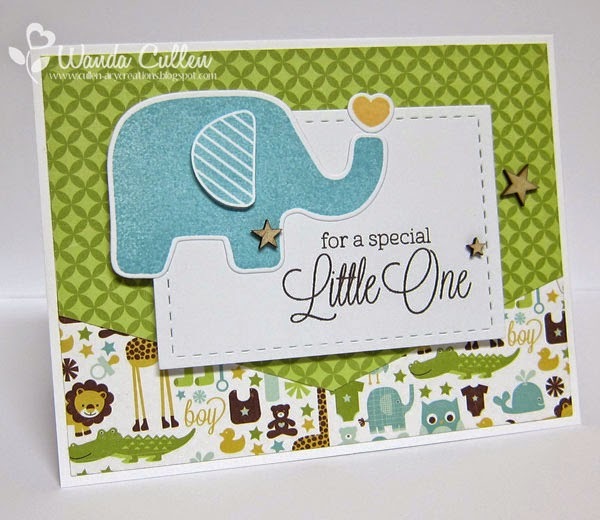 A very quick and easy baby card! PAPER: Ooh La La For Her by MME, A Walk in the Park by Echo Park, Vintage Cream (PTI), Yellow textured paper by Bazzil. INK: Groovy Guava, Lucky Limeade, Black Licorice by MFT. ACCESSORIES: Fishtail Flags Die-Namics by MFT, Petals 'n Posies Confetti Cuts, Pretty Panels Diagonal Stripes, Class Act Confetti Cuts, Groovy Guava stitched ribbon by SU. Hey everyone! 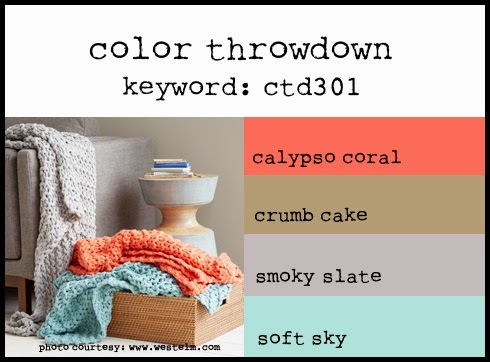 I'm the hostess for this week's Color Throwdown Challenge and thought these gorgeous throws were a great color inspiration. 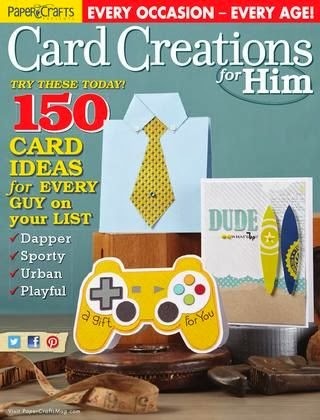 Will admit I had to really put my thinking cap on when it came time to create a card - lol! I went with some new PTI goodies that I recently acquired. Love the modern floral design to this 2-step stamping Garden Grace set...cutting out several of the the flowers and popping them with foam dots for more dimension. 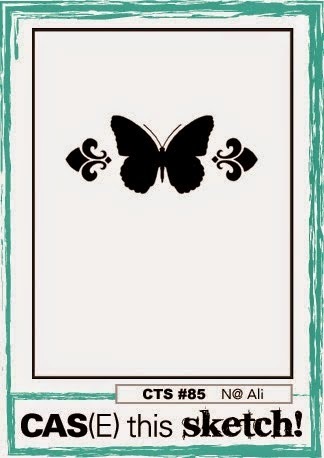 STAMPS: Garden Grace (PTI), Phrase Play #5 (PTI). 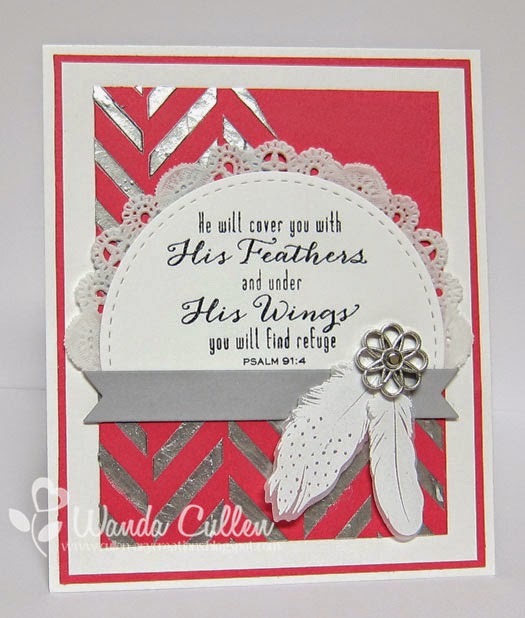 PAPER: Teresa Collins "Memorabilia" pad, MME "Cowboy" pad, Calypso Coral (SU), White textured ready made card base. INK: Calypso Coral, Soft Sky. ACCESSORIES: Garden Grace dies by PTI, Happy die by PTI, Jute twine, Button (SU), Enamel dots by MME. I love the current Retrosketches Challenge layout, so wanted to create with new Verve goodies using that sketch! 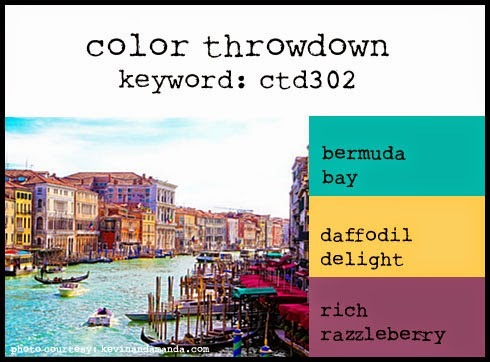 I was also inspired by the photo for the Anything Goes theme at Curtain Call Inspiration Challenge - so many soft, pastel shades of color. Congrats to Stacey on her 100th challenge! Be sure and stop by the Curtain Call blog...there are a boat load of giveaways to celebrate this milestone! 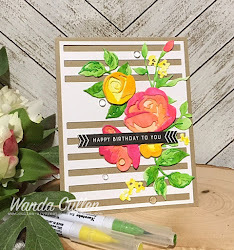 Then, I'm also playing along with Verve's July Diva Dare challenge - an "Inside Out" theme to create something on the inside of the card that carries over the theme on the card front. I kept the inside very soft by using pale ink shades - Pink Pirouette and Soft Sky. The flowers were stamped with Memento Rich Cocoa ink then colored with Copics. I added some Diamond Stickles to the stamens (need to check if that's the correct plant anatomy term - lol). Borderline - all by Verve. 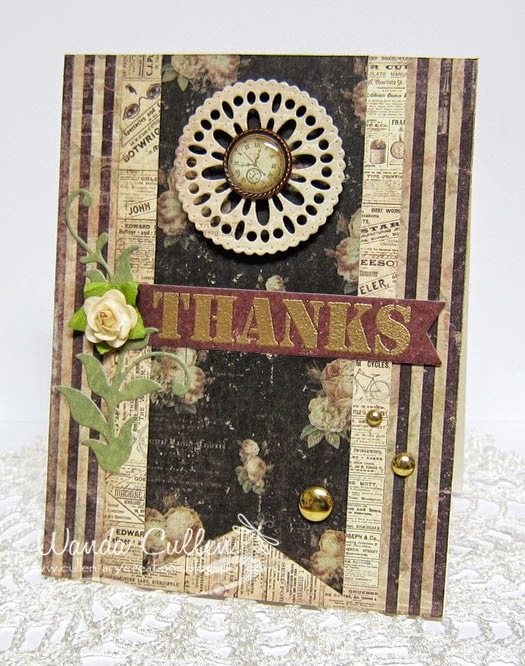 Vintage Cream, X-Press It Blending Card. ACCESSORIES: Happy Doodles dies by Verve; enamel dots by MME, Stitched rectangle die by Lil Inker Designs, Fishtail Flags Die-Namics by MFT, Diamond Stickles.